This week my husband Joe, and son Benjamin, 19, are off all week for Thanksgiving. Son Joseph, 16, has off Thanksgiving Day and Friday, as well as Lovina, 14, and Kevin, 13 from school. So it seems as if this week will go faster than usual. Saturday our three sons and Joe went to help at sister Emma and Jacob’s house again, preparing for the upcoming wedding of niece Emma and Menno on December 7. Menno’s family was there also helping. I decided to stay here and keep sewing. I did make a potato casserole to send along with Joe and the boys, to make lunchtime a little easier for Emma and her daughters. Today Joe and Benjamin are helping son-in-law Mose replace some windows in their house. This should make their house warmer this winter. With the windows out, the house is cold so daughter Susan and baby Jennifer came here for the day. Susan brought her sewing along to work on here. 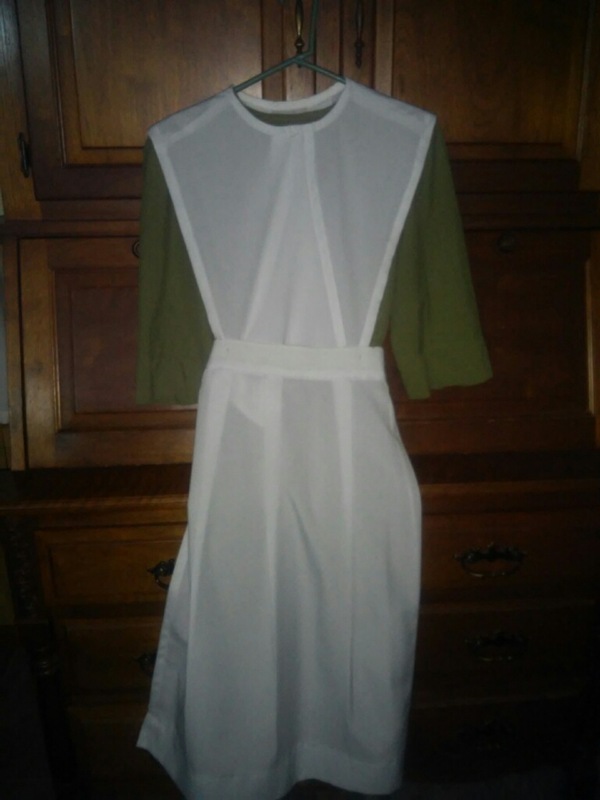 After the girls and I washed our laundry, I also sewed and managed to get my dress and part of my cape sewn too. Recently a reader asked what a cape is. It is the triangular piece of fabric that goes from the waist and over our shoulders and crosses in front. Then the apron is put over the bottom of the cape and belted around the waist. In our community capes are usually worn to church weddings and special occasions. For church, a white cape and apron is worn, but for a wedding we wear the same color cape and apron as our dress color and material, which we call a “dress suit.” I hope that explains enough on the cape. I do not get to see your questions on the website, so I appreciate my editors taking time to print them out and mail them to me. I was encouraged by all of your kind words, so I want to say thank you! Front of typical cape, apron and dress for a wedding in Lovina’s community. 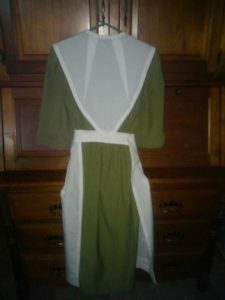 The same dress for a wedding, showing cape and apron from back. Another question was about what an Amish bride wears. This can vary from one community to the next. In some communities the brides will wear a black dress with white cape and apron. In our community, the bride chooses her color of dress, but wears a white cape and apron. Also in our church community, a bride wears a black covering to the wedding service. After she is married she changes to a white covering and won’t wear a black covering again. The unmarried girls wear black coverings to church services, but wear white coverings at all other times. Daughter Elizabeth was married in a burgundy color dress and our daughter Susan chose a green dress. I hope this explains it well enough. Some brides sew their own dresses, while other have their mother or someone else sew it. Daughter Elizabeth sewed her own wedding dress but I sewed Susan’s wedding dress. I made my own wedding dress but I didn’t have a choice in the color because all brides in that community wore black dresses with a white cape and apron to get married. Another question a reader asked was why we use sawdust in horse stalls instead of straw. I think it is just whatever someone prefers. Joe thinks it’s easier to muck out the sawdust and we can also get it free from local saw mills. To the reader wondering what we use to wash windows, we use white vinegar and warm water, using cheesecloth towels to wipe dry—and any rag to wash. Do not use any fabric softener to wash the cheesecloth towels. A reader requested my Sloppy Joe recipe. I try to make it similar to son-in-law Moses’s “recipe” but since he doesn’t have a recipe and just puts in a little of this and that, I tried to write down amounts. Add or take out any of the ingredients if you prefer. Our children love when Moses makes Sloppy Joes. Enjoy! God’s blessings to all and Happy Thanksgiving! Brown sausage and venison together in skillet or large pan. Add rest of ingredients, stir well, and heat through. Serves 12 or so. Other seasonings of your choice can be added. Amish weddingLovina EicherLovina's Amish KitchenSloppy Joe Recipesloppy joes using venisonThe Essential Amish Cookbook: Everyday Recipes from Farm and Pantry.